Fall is here, y'all. Okay, maybe not technically, but back-to-school time is here. I start classes tomorrow... my third year of graduate school. If you have children, they're probably going back to school around now too. Time to get back into a routine! I'm going to have jam-packed days this fall since all 3 of my classes are night classes that I'll go to after work, which will inevitably make it more difficult to find time to work out. This is when I need exercise most, though -- when stress and demands are high, working out is my sanity-saver. This busy schedule means I'll have to get back to working out super early in the morning most days. While I've been doing that some during the summer, I've had more flexibility in my schedule -- sometimes I've even been able to go to the gym in the middle of the day. I've also enjoyed taking advantage of the nice weather and fitting in outdoor workouts before dinner. Why outdoors if I belong to a gym? Well.... I do like going to the gym. However, I don't like going to the gym when it is overflowing with people. You will never find me there at 6 or 7pm on a week day --- tooooo many bodies there for me. So if I don't find time to work out in the morning but still want to squeeze in a workout before the day ends, I tend to take it outside. Also, while getting to my gym is quite convenient (it's not even a mile away), sometimes I only have half an hour to fit a workout in. Why waste the 5 minutes driving and parking when I can just walk outside and torch some calories? Plus, when the weather is nice, nothing beats the combination of endorphins and vitamin D.
While it's going to be more difficult for me to find time for these outdoor workouts come tomorrow, I still plan to squeeze them in when it works. All you need is 30 minutes, some tennis shoes, a flight of stairs, and a bench to get an AWESOME high intensity interval training workout in. I'm lucky to have a beautiful space 2 blocks away from me that has stairs, benches, and plenty of space -- not to mention a view of the Baltimore harbor and skyline. Not too shabby. Want to do your HIIT at the gym? Check out my HIIT treadmill workout and my full-body HIIT & circuit training workout. 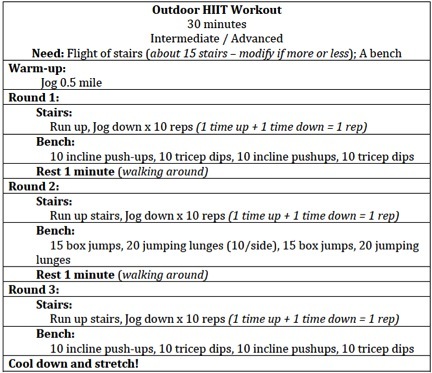 And if you complete this super challenging outdoor HIIT workout -- feel free to enjoy an ice cold beer (along with plenty of water!!!) afterwards. You will DESERVE it. awesome workout!!! I can't think of anywhere close by where I have stairs, but I could modify!